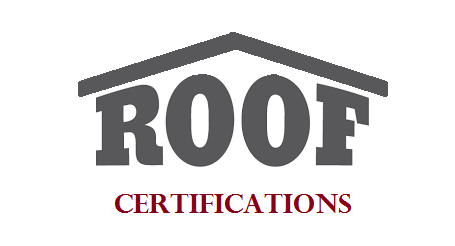 A roof certificate is part of a real estate transaction. Many lenders will not write a loan for a new purchase or a re-finance without a roof certification as FHA and HUD require that the entire roof surface be certified to "find that the roof is in good condition for it's age, does not leak and has an estimated remaining useful life of over 2 years." Basically, a roof certificate is a written document from a detailed roof inspection that informs all parties about the general condition of the roof, estimates the life expectancy of the roof and tells all parties of any repairs that may be necessary. This gives peace of mind to the buyers because if there are any repairs that need to be made before they close, they can address those as part of the real estate transaction. There are no surprises after the fact. Home inspectors and appraisers do not do a full roof inspection, because they are not qualified to do it. They do however make notes on the general condition of the roof. A roof certificate is not the same as a home inspection and must be completed by a qualified roofing contractor. The roofing contractor must stand behind the certification. Also, home owners need to be aware that a roof inspection is different than calling up and getting a free estimate. A free estimate is not enough to support a real estate transaction. At AED Roofing and Siding, we'll inspect your roof and provide documentation for closing purposes. Just contact us today to schedule a date and time!